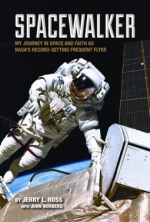 Spacewalker – My Journey in Space and Faith as NASA’s Record-Setting Frequent Flyer reads like a young boy’s dream come true, despite all the backsliding and frustrations. Born and raised in rural Indiana, Jerry Lynn Ross (1948) was inspired by rockets, unmanned and manned space flights and the evolving US space program. He chose to chase his dream to become an astronaut, and got his engineering education at Purdue University. The autobiography shares about the career as test pilot with US Air Force, the NASA selection process of new classes of wannabe astronauts and finally the inclusion of Ross in the astronaut program. Ross served more than 30 years as astronaut, went up with a Space Shuttle 7 times, even more than the John Young record. The unforgettable experience of launch, the delights of weightless living, the amazing view of the earth from space, and the 58 of hours of space walks to launch or repair satellites and constructing the International Space Station. Life on the ground, at training facilities, huge water tanks, family life and international encounters in Germany and the USSR are described. Only one military Space Shuttle Flight is still classified. Maybe the funniest storyline is the reluctance to learn to swim and how Jerry got his scuba diving certificate. Ross experienced the loss of Space Shuttles Challenger (after its launch) and Columbia (upon re-entry in the atmosphere) from nearby. The Columbia disaster also meant the end of the Space Shuttle Program and the chance for Ross to ever go up as astronaut again. The past couple of years he served as consultant and trainer. Ross’ own story is alternated with quotes from his wife and children. Ross, faithful and thankful to God also shares his faith on numerous places in the book. Finally there’s his criticism on the current deadlock in the NASA space program. Without manned space flights in sight, many experienced engineers, pilots and astronauts have left the agency, while young people don’t have an inspiration to bring the space program further. Jerry Lynn Ross is an Indiana native, a graduate of Purdue University, a retired United States Air Force officer, and a former astronaut who retired from NASA in 2012. He is a veteran of seven US Space Shuttle missions and holds an individual world record for the most spaceflights flown. John Norberg is a writer based in West Lafayette, Indiana. He is an experienced journalist and the author of five books, including Wings of Their Dreams (2003) about the role of aviation’s pioneers and trailblazers in the history of flight and space. I received an advance reading copy through Netgalley to serve you my impressions of this book.